Mic Drop- A performance so solid, that there is nothing more to be said. I am not sure when and where the phrase “mic drop” originated. The first time that I became aware of it was when I saw Eddie Murphy do it in the movie, Coming to America, after exclaiming, “Sexual Chocolate” and then exiting, stage left. While the origination of the term “mic drop” remains in question, the meaning of it is pretty clear. The mic drop is what is left, when there is nothing more to say. It is the spiking of a football, the shattering of a record, the home run ball that will seemingly never land. It is the sacking of the quarterback, which requires no celebration- just a hand clap, and a jog off the field. It is the knowledge that you nailed it, and it is not up for discussion. It is the walking back to the dorm, when you know that you aced it. The mic drop is the delivery of a performance, which leaves nothing else to be demonstrated and no real reason for debate. It is a speech delivered with such profound impact, that no further words are necessary. It is a song sung with such beauty, that the only justifiable action is to just stop, and let the audience soak it in. It is a power clean performed with such precision, strength, and speed, that the only thing to do is drop the weight, and victoriously walk off of the mat. It is a performance which is executed with such precision, that the most appropriate thing to do is stop and walk away, allowing all in attendance to take it all in. 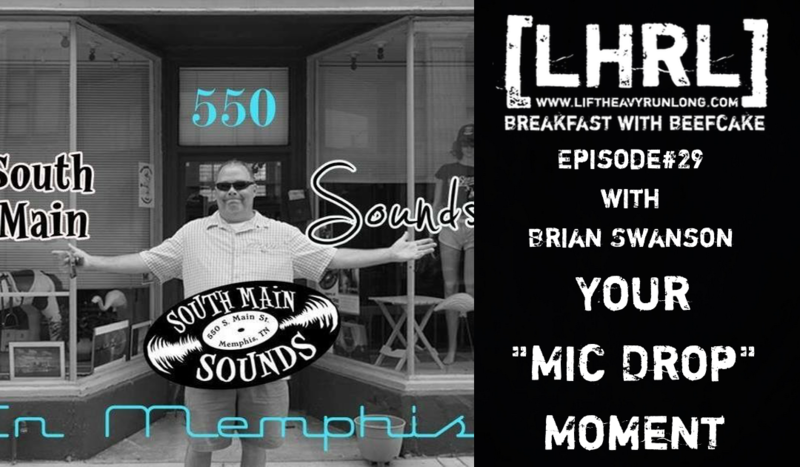 Last weekend, my brother, Ted, was performing an acoustical set at South Main Sounds in Memphis, TN. South Main Sounds is an abandoned art gallery (“abandoned” might be an exaggeration…but I can be a bit dramatic) in the downtown area, which was taken over by Mr. Mark Parsells. Mark has furnished the building and turned it into a performance studio for singer songwriters. It is really a neat place with a great atmosphere, an intimate setting, and a respectful audience, which allows you to really make a connection with the performers. I highly recommend it. Amanda, the kids, and myself decided that we would load up the car and head downtown, to hear Ted play his music. Amanda had never heard him. I had not heard him play in this type of setting, not since I sobered up while back. Amanda was excited because she had never heard him play….I was excited because I had. It was about to go down. It was about to get fun. As Ted took the stage, alongside another extremely talented performer, Melinda Milligan, my stomach churned with anticipation. It churned because I knew. I knew what was about to happen. I know how powerful Ted can be when his lyrics are put on display in the right atmosphere. I know what it looks like when the spell is cast over the audience, as each person gazes blankly, while their minds drift off to a distant memory, until the rolodex of experience begins flipping backwards, until it stops, and makes the perfect connection between the memory and the harmony. I know what it sounds like, when a profound verse awakens each listener from their trance, and they let out a gasp, as if being lightly punched in the stomach- expressing that the music has moved them from inside. There was no need for me to try and explain to Amanda what was about to happen. She would see it soon enough. I would keep my excitement to myself, so that I could play with it, and allow it to stir inside of me. Ted was about to perform. He had earned this moment. The mic was about to be dropped. As Ted sat on the stage and performed exactly as I predicted, I sat there with pride, as if I, myself ,were the one on the stage. I was proud because I know how much work went into this performance. I have seen the sacrifices that come with learning to play an instrument, writing powerful lyrics, and singing a strong song. I know what goes into perfecting a craft, and never finding perfection, so you keep perfecting, under the undying delusion that you will someday perfect it. As he sat there, delivering blow after blow of spiritual jabs through his music, I felt privileged. I felt privileged, because I know what it looks like to earn a moment like this. I know what it looks like to be awarded the opportunity to display your hard work and dedication to something, along with the opportunity of earning the right to perform the metaphorical “mic drop”. I know what it looks like leading up to this moment….and most of those moments, look nothing like this moment. Ted, and everyone else who has ever worked hard for something, knows that this “mic drop” moment began many years ago. It wasn’t as if he just strolled up, shook a couple of hands, plugged in, and started captivating people’s attention and stirring their imaginations. It didn’t start with mics being “dropped”, so much as mics being “knocked over”. It started with chords being missed, while lyrics were forgotten. It began with strings that broke, at the most inopportune times. It started with closed doors, cancellations, no shows, and breakdowns. This moment was nearing closer, as amplifiers blew, and there was no money to replace them. This moment comes with the cracking of the voice, as the audience tries not to cringe. It comes with nerves, and fear, and cold feet, and the desire to retreat. It comes with drunken audiences who care nothing about the song, and wish that he would stop blocking the TV. It starts with pedals that don’t press, mixers that don’t mix, recorders that don’t record, and green lights flashing red. The price of admission is the feeling of defeat, as you pack up your equipment and the self-doubt takes control. This performance began as a disaster- a promise to never play again. It was sore hands, calloused fingers, and a scratchy voice. It was the forgetting of equipment, the dropping of picks, and the tangling of chords. It was rooms with poor sound, and audiences with bad taste. This trade takes years, it takes drive, and it takes guts. I guess most things worth doing come with all the things mentioned. This is what made me proud. This is why I felt privileged. I felt privileged to know what it looks like to go after what you want. Privileged to know what it looks like to dust yourself off, bandage the wounds, get a good nights rest, get back on the horse, with the knowledge that, at some point, you will be knocked off again. I felt privileged to know that it’s worth it, that it’s worth the hard work. I guess that I’m lucky to be aware of these moments, so I can go try for myself. If I want to have my mic drop moment, it starts with picking it up, and knocking hundreds of them over, before having the opportunity to hold out the mic, and let it just drop. What are your working towards? Where does your mic drop? Keep working towards that mic drop, regardless of what area of life you are focusing on. Keep going. Perform. Drop the mic. Embrace the adrenaline. Would love to hear Ted if we get to Memphis this Summer. Maybe when you and Amanda visit her family bring Ted along and give us a special show.